Creating masterful Video on Instagram content just became a lot easier thanks to an update that allows users to import pre-shot video clips into their filtered, 15-second montages. Instagram 4.1 for iOS and Android includes the ability to call on footage from the Camera Roll or Gallery apps, rather than having to shoot clips on the fly and in chronological order from within the app. Instagram videographers can now, to cite one random example, stitch together their favourite clips from their day at the beach, just by calling them up, and dropping the snippets into the timeline. Access to pre-shot footage also gives users more control via the new trim tool or other editing apps to obtain frame-by-frame precision, remove rough edges and ensure each segment is of perfect length. 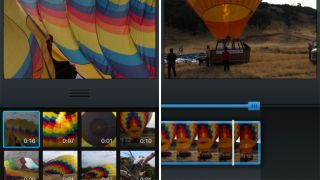 Users will also be able to choose how to square crop their footage, just like they can with photos, which will make it easier to create well-framed video clips. Today's update, although arguably removing a lot of the skill required when crafting great clips, makes it even easier for Instagrammers to end up with a polished product. "Video Import from libraryhas been one of the most requested features from the community since the launch of Video on Instagram," the Facebook-owned company wrote in a press release. "With the ability to import video from their library, we're giving people more creative control and broadened the scope of moments they can share, even if they already happened. In addition, we're providing a powerful and simple to use video editing tool." Other improvements within Instagram 4.1, which is rolling out today, include a photo straightening tool for the iOS app and video support for Android phones running the Ice Cream Sandwich flavour of the OS. Today's news may change things, but despite Instagram's assault on video, Vine is still winning the battle.